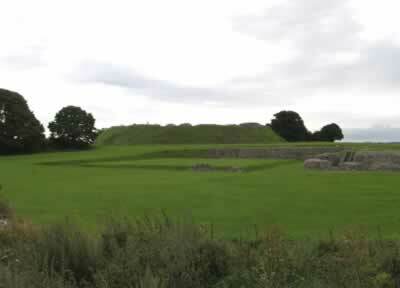 Old Sarum Castle was originally an oval Iron Age hillfort and later in the 9th century a fortified Saxon burh. Soon after the conquest, King William I founded an earth and timber ringwork and bailey fortress within the hillfort and paid off his army here in 1070. In the late 11th-early 12th century Roger of Salisbury founded the stone castle, when adding the Great Tower, Herlewins' Tower, the Kitchen Tower and a royal palace to the inner bailey. In 1170-80 the ringwork was encased by a curtain wall, flanked by an inner gatehouse and in the early 13th century King John added a new hall. Later in the 13th century the military importance of the site declined and although 14th century repairs were made, in 1514 materials from the castle were being removed. The eastern ward of the hillfort, was originally the lower bailey of the castle, a new town complete with a Norman cathedral and a bishops palace utilised the rest of the bailey. In 1140, the hillfort defences were given an outer curtain wall but after the soldiers and priests quarrelled, the cathedral was abandoned and moved to Salisbury in 1220. 17 miles south-west is Old Wardour Castle. Old Sarum Castle is located north of Salisbury, off Castle Road. 25 miles north-west of Southampton, on the M27-A36. The site is owned by English Heritage and is open daily, July and August 9:00-6:00pm, April to June and September 10:00-5:00pm, October to March 10:00-4:00pm.